Share this Home with Your Friends! DON’T MISS THE VIRTUAL VIDEO HOME TOUR! You’ll love this luxurious masterpiece both stunning and spacious nestled in the mountains of Sky Valley, the highest and coolest city in Georgia, only minutes from Highlands NC. The main level features an open great room with a fireplace, and large formal dining room. Enjoy cooking and entertaining? Then this custom kitchen and dining area for all your friends and family. With an official population of under 300 citizens Sky Valley, Ga encompasses 3 square miles of land. Sky Valley is a unique place to live and play. In 2004 the remaining development is sold, and the ski slopes closed, leading to the creation of Sky Valley Resort & Country Club, a lifestyle designed community nestled in the scenic mountain valley of Rabun Bald. With 18 holes of championship golf, hiking, walking trails, and many other activities within 15 minutes, Sky Valley Resort & Country Club is the perfect mountain escape! A beautiful round of Golf at Sky Valley Country Club is the favorite of locals and visitors. After the clubs redesign in 2007, this challenging course is fun for golfers of all ages. It is voted as the best public course in the State of Georgia. With 18-holes of amazing views and challenging holes, golf here will not disappoint. Furthermore, this club offers membership for locals and is open to the public. After the round, enjoy a drink and lunch at the 19th Hole. 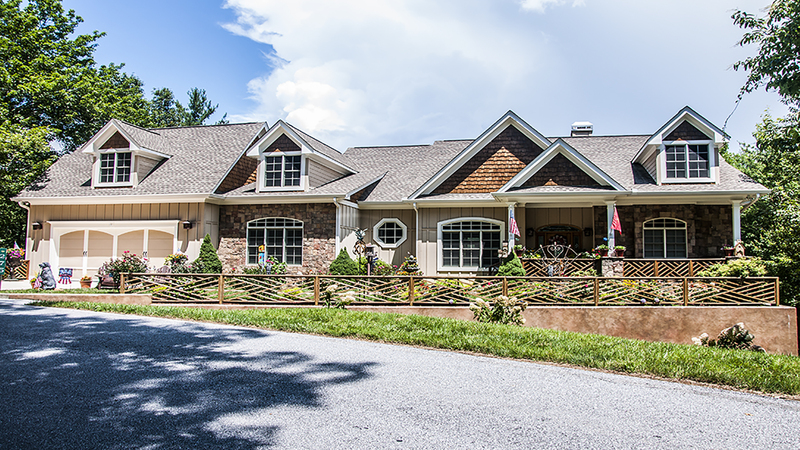 275 E Sugarbush Dr is Sky Valley Real Estate at the Sky Valley Resort and Golf Course near Highlands North Carolina. Chip Durpo is the Real Estate agent to call when shopping for Sky Valley Real Estate, Houses for sale and Sky Valley real estate for sale. Chip can help you find property for sale in Sky Valley Ga. Be sure to watch the full video tour. The Sky Valley Resort & Country Club Clubhouse is offered to members of the Country Club. With many tiers of membership, joining socially gives you access to the clubhouse restaurant and other many other amenities, excluding golf. The Clubhouse hosts yearly events that are open only to members. Moreover, these events are fun for everyone and a great time to mingle with friends and neighbors. Tennis is a leisurely past time in the resort. The courts are located adjacent to the course and offer beautiful valley views. There are clay and asphalt courts. While a membership is required, for a nominal fee tennis lover can enjoy round robins and pick-up games. Additionally, Pickle Ball is another available amenity at the Country Club. With public and private courts, Pickle Ball lovers can enjoy round robin and team competition with other residents. Courts are located in the valley, as well as adjacent to the golf course. Homes for sale in Sky Valley, Ga are surrounded by the exquisiteness of the North Georgia mountains. With everything a short drive away, Sky Valley offers modern conveniences with a small community feel. Surrounding Sky Valley Country Club, Sky Valley real estate has many unique qualities. Furthermore, with optional tiers of membership and no HOA, houses for sale in Sky Valley, Ga offer the country club feel without the extra fees. Sky Valley Ga Real Estate for Sale. can be found with beautiful view from the mountains to the valley to the challenging and fun 18-hole golf course. Sky Valley real estate is available in everyone’s price range. There are plenty of move-in ready and fixer upper options for everyone! Therefore, when you are looking for houses for sale in Sky Valley, Ga contact Chip Durpo at 706-746-2900 for expert help finding your dream home! You may also be interested in homes for sale in popular zip codes like 28775, 28741, or in neighboring cities, such as Highlands, Scaly Mtn., Clayton, Rabun Gap, and Tiger.